Shoppers can now dispose their used batteries in thousands of shops throughout the UK as of this month with the new battery recycling law coming into force. Under a European directive, shops selling more than a pack of batteries a day are forced to accept old batteries for recycling. Most are expected to set up in-store collection points and many manufacturers are supplying disposal bins for shops to be compliance with this new law. The change will bring the UK into line with many European countries, where recycling boxes for batteries have been a common sight in shops for years. The British public use over 600 million batteries every year, an average of 21 per household however, the UK has a dismal record in recycling them. The overwhelming majority, 97 per cent are thrown into domestic bins and end up in landfill, where batteries and its toxic metals: lead, cadmium and mercury leak into the ground and cause pollution. The Waste Batteries and Accumulators Regulations 2009 is the latest attempt to transform Britain into a greener society by dumping fewer materials. 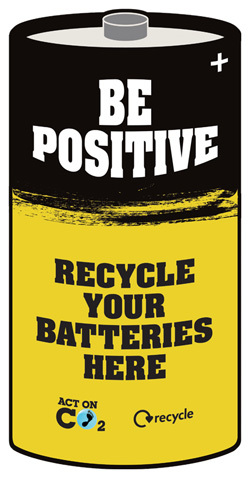 Any high street or online shops selling more than 32kg of batteries a year (equivalent to a pack of 4 x AA batteries everyday), will have to provide recycling bins or facilities. The Department for the Environment says increasing recycling will cut greenhouse gases linked to battery production and Food and Rural Affairs (Defra) which estimates that hitting the 2016 target could save 12,000 tonnes of carbon dioxide emissions annually. Cell Pack Solutions suggest consumers switch to rechargeable batteries to limit the amount of waste being produced. A fantastic alternative to alkaline batteries is the Ansmann maxE Rechargeable Batteries Range which can be found on our Online Shop.